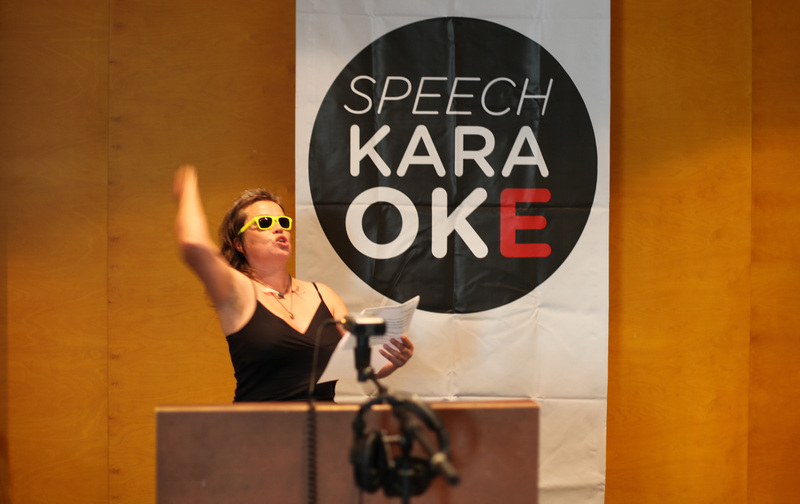 Speech Karaoke is just like traditional karaoke, except that participants choose a speech from the karaoke folder instead of a song. The selection of speeches ranges from world famous historical speeches to local and private speeches. Speech Karaoke will for the first time take place in Helsinki, at the Helsinki Festival Week club at Kansallisteatteri and at Kiasma. The Karaokevideo for Yrjö Hakanen's speech "Miksi olen kommunisti"
Speech Karaoke is developed by the artist group THE SPEECH KARAOKE ACTION GROUP. The members are: Frank Maria Brümmel, Krister Gråhn, Tellervo Kalleinen, Oliver Kochta-Kalleinen, Tuomas Aleksander Laitinen, Carl Sebastian Lindberg, Pilvari Pirtola, Johanna Raekallio, Satu Rautiainen, Pasi Rauhala, Jyrki Riekki, Hanna Saarikoski and Julius Valve.